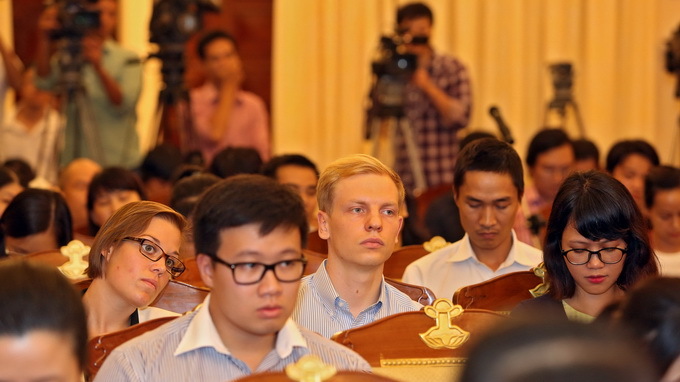 Vietnamese and foreign correspondents attend a press conference held by the Vietnamese Ministry of Foreign Affairs in Hanoi on August 7, 2014. Vietnam will verify the information that China is making field measurement in Vietnam’ Hoang Sa (Paracel) archipelago, but all of the Chinese activities there are illegal and invalid, the Vietnamese Ministry of Foreign Affairs spokesman Le Hai Binh said on Thursday. Binh made the statement at a press conference the ministry organized in Hanoi when asked by reporters about Vietnam’s reaction to the information on China’s Nanhai Maritime Safety Administration having finalized its field measurement survey on five islands of the archipelago to look for suitable sites for the construction of lighthouses. “Vietnamese competent agencies are actively verifying this information. However, we have repeatedly affirmed Vietnam’s indisputable sovereignty over Hoang Sa and Truong Sa (Spratly) archipelagoes. Therefore, all Chinese activities in the two groups of islands are null and void,” Binh said. The spokesperson was also asked about Vietnam’s response to a report that China will use a deep-water vessel, HYSY 721, to carry out a geological survey and oil and gas exploration activities in the East Vietnam Sea. In reply, Binh stressed that all activities conducted by any parties concerned in the East Vietnam Sea should comply with international law, especially the 1982 UN Convention on the Law of the Sea (UNCLOS), and should respect the sovereignty, sovereign rights and jurisdiction of coastal countries. At another press briefing in Hanoi on July 31, Binh also emphasized that all actions of any parties in the sea area must be in line with international law, and that all parties should not take any action that complicates the present situation and affects peace, stability, security and the safety of both navigation and aviation in the area. The Vietnamese Ministry of Foreign Affairs has repeatedly affirmed that Vietnam has full historical and legal evidence to prove its sovereignty over Hoang Sa and Truong Sa. Hoang Sa is an island district of the central Vietnamese city of Da Nang while Truong Sa is also an island district of south-central Khanh Hoa Province.